We all have favorites—whether they are family recipes or ones just discovered at last year’s cookie exchange. Kick off the new year with a celebration of cookies with Bakers Dozen! 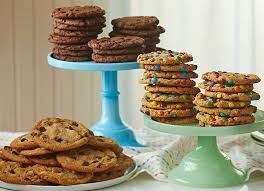 Bring a platter of your favorite cookies to share (2 dozen should be good). This can be from a cookbook or your own. Send us the recipe with the brand of butter (salted, unsalted) or other fat and flour (all-purpose—bleached or unbleached). We will have index cards at the program so you can label your batch and note ingredient choices. After tasting, we will have a discussion on the various choices and outcomes, followed by the traditionally delicious lunch served by Foreign Cinema. IMPORTANT: Send us your recipe in advance and specify butter/fat choices and flour type for discussion purposes. We will scan and distribute all recipes to attendees after the program.